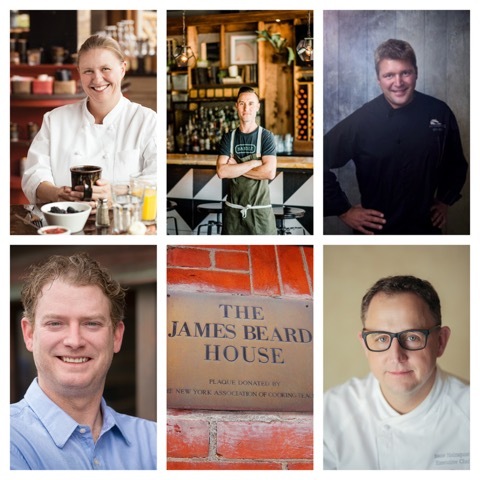 Chefs from five of Park City, Utah’s top eating establishments have been invited to present their craft at a special dining event at the historic James Beard House in New York City’s Greenwich Village. Chefs Jodie Rogers, Deer Valley Resort’s Director of Food and Beverage; Briar Handly, Chef/Partner of Handle; Seth Adams, Executive Chef and Owner of Riverhorse on Main; Zane Holmquist, Vice President of Food & Beverage and Corporate Chef for The Stein Collection; and Matthew Harris, Chef/Owner of Tupelo Park City will combine forces on Thursday, Sept. 20, showcasing Park City’s diverse, creative and hyper-innovative food culture. Each of the five, award-winning chefs invited to present are integral in setting the standard for Park City’s vibrant restaurant scene. Accolades from the group range from regular guest appearances cooking on Today, Forbes Travel GuideFour Star ratings and the prestigious DiRōNAaward to Salt Lake Magazine’s Best Restaurant, Wine Spectator Award of Excellence, Zagat Top 10 Utah Restaurant awards and many more. The evening will begin with Utah-centric hors d’oeuvres including compressed Green River melon, Tupelo Farms sunburst tomatoes, and hop-smoked Utah trout, paired with two signature cocktails from Park City’s own High West Distillery. Guests can enjoy the Little Hollywood, High West’s Double Rye! with guava juice, earl grey syrup, tarragon leaves, live juice and tarragon, and the Distillery’s tried-and-true Old Fashioned of Rendezvous Rye, demerara sugar and angostura bitters with a citrus twist. The dinner menu features smoked parsnip with granny smith apple and beet root, rabbit saddle porchetta and cider-braised rabbit leg, and 44 Farms Wagyu beef short rib. Two pre-dessert High West sippers will be served, including A Midwinter Night’s Dram and a new spirit blend revealed exclusively to the James Beard House dinner guests. Sumptuous grilled figs with goat’s milk ricotta and honeycomb will round out the evening. The James Beard Foundation’s mission is to celebrate, nurture and honor chefs and other leaders making America’s food culture more delicious, diverse and sustainable for everyone. Chefs from across the country are invited to “perform” at the Beard House by presenting dinners to Foundation members and the public—a 74-guest maximum capacity. Chefs are recommended by the Chef Selection Committee and invited by the director of house programming based on a high criteria standard. Tickets for the exclusive Park City James Beard dining event sold out within a week. To learn more about the James Beard House presentation and the participating chefs, contact Christa Graff with Graff Public Relations, LLC, at 435.640.7921 or christa@graffpr.com. Additional information on Park City’s dining scene and events can be found at parkcityrestaurants.com.